Cooking with the enigmatic title "meat in French" will not take much time and does not require culinary expertise. Enough to have the oven and the necessary ingredients. Rich, familiar with the childhood dish I try to prepare for the holiday table. The only difficulty in cooking meat in French is a choice of fresh meat. If it is stale or spoiled, good quality and tasty dishes will not work. 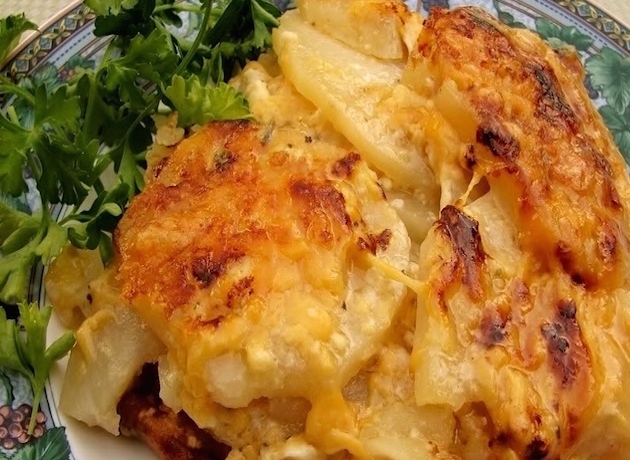 There are many ways how to cook French meat with potatoes. You can also cook the meat separate from the potatoes, but cooked meat and potatoes together is a more hearty and delicious. For the preparation you need to pick up the main ingredients. It's potatoes, pork, onions, mayonnaise, cheese, spices and vegetable oil. The number of all components depends on the amount of the meal, and the preferences and taste of the hostess. You should choose medium fat meat: if meat is fatty, it simply drained, and the lean will be tough and dry. The flesh is cut into plates with thickness up to 2 cm along the grain, after which it needs to beat with a hammer (meat pieces should be 1 cm thick). Then the meat is salted, sprinkled with black pepper or a mixture of different peppers to taste and leave in this state for some time. And while it is possible to cook potatoes. It is clean, washed and cut into small slices. After that, the potato is placed in an enamel bowl, pour vegetable oil and prisalivaya. After it is stirred, but gently, so as not to damage the slices, cover the bowl with a lid and allow to stand for. Now we need to peel onions and cut into half rings. While heated oven, you need to grease a baking sheet with vegetable oil and putting it all prepared ingredients. The first layer put potatoes, a second meat. The meat is placed on top of the onion. All of this is smeared with mayonnaise and then sprinkle with cheese, grated on a coarse grater. All the Goodies you want to place into the preheated oven for 1 hour. Signal the readiness of a dish are light punctures the meat with a fork and fragrant smell. For a more refined taste, you can use another recipe. After the meat repulsed, it needs to be put in an enamel container and pour dry red wine, let stand about half an hour. During this time the meat will absorb the flavor and taste of the wine, after which a dry heated frying pan need lightly fry. Chopped half rings onion marinate 15-20 minutes in Apple cider vinegar – as a result of leaving it sharp. On a baking sheet, lightly greased with butter, lay out the potato slices and then meat, onion, mayonnaise and grated cheese. Next, the dish is prepared according to standard recipe. A mandatory element of meat in French is a Golden baked crust "graten", which is formed at the end of cooking. For variety you can always add the meat and onions, a layer of eggplant, mushrooms or tomatoes.